Police stopped a van towing a stolen woodchipper in Chichester yesterday morning. Picture courtesy of PC Tom Van Der Wee. Police stopped a van towing a stolen woodchipper in Chichester yesterday morning (Monday), according to a Sussex Police constable. PC Tom Van Der Wee said officers made three arrests after intercepting a van towing the woodchipper which was stolen in Fernhurst at around 10am. In a tweet, he added: "The three occupants were arrested, their van seized and the woodchipper returned to its’ grateful owner." PC Van Der Wee said the people arrested were all male; a 17-year-old boy, a 46-year-old man and a 29-year-old man from Bordon, Hampshire, on suspicion of theft. He confirmed they have been 'released under investigation'. 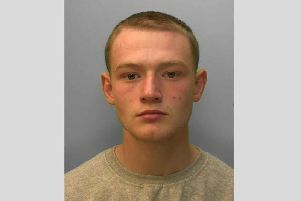 The officer also highlighted the teamwork involved, revealing on Twitter that it was a joint operation with '@sussexroadscop and colleagues from response in #Chichester'. It has now been confirmed by Sussex Police that the £30,000 machinery was found using 'tracking information'. Read more here.